This iron plant stand is finished in black. Four pie-shaped platforms are ready to stage the plants of your choice. Give four of your favorite plants a supremely stylish showcase! 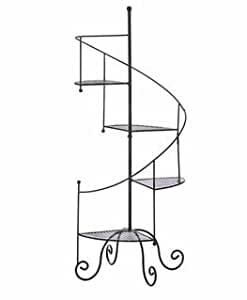 This metal plant stand features four mesh platforms, a curved âbanisterâ and four scrolling feet below. Standing at more than three feet tall, its a grand way to exhibit your green thumb.